The tractors moved at a steady speed of between 2.5-3 mph, much faster than the often 1 mph or less of hand-thinning crews. 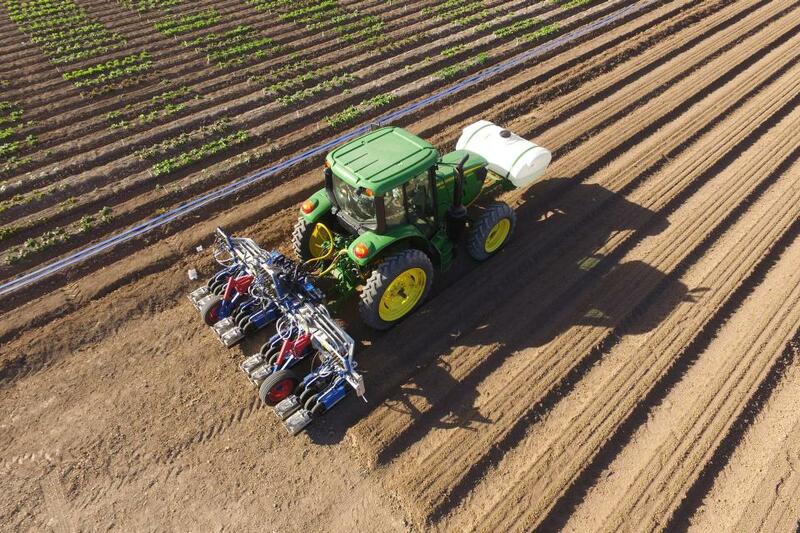 Recently, the University of Arizona’s Yuma Center of Excellence in Desert Agriculture (YCEDA) hosted a unique event highlighting some of the technology aimed at solving challenges in the lettuce and specialty crop industries. According to a post-event report written for Precision Ag Professional by Nate Dorsey, Agronomist for RDO Equipment Co. based in Yuma, among the most popular equipment discussed at the Automated Thinning and Weeding Technologies Field Day was automated lettuce thinners. Dorsey writes: With lettuce being planted at such populations and most fields experiencing good germination and emergence, the result is extra plants that must be removed from the field to ensure the desired plants have access to the space, sunlight, water, and the nutrients they need to successfully grow. This means that farms must hire large numbers of seasonal workers to manually thin plants, trusting that they will select the most vigorous plants, use consistent plant spacing, and thin to the correct population. But, because they’re human, this method is far from perfect. At the Automated Thinning and Weeding Technologies Field Day, growers and other industry members had the opportunity to learn from companies developing machines and watch them operate in the field. Three lettuce thinners were on display from Agmechtronix, Mantis Ag Technology, and Vision Robotics Corp. All three machines use the same principles – cameras to detect plants, advanced computers and artificial intelligence systems to process information, and a spray application system to deliver a dose of fertilizer or herbicide to remove unwanted plants. For the full article and photo gallery, visit PrecisionAg.com.